Spider-Man’s proving to be quite a Clothes-Horse in his upcoming Homecoming sequel, Far From Home: Crafty photographers (including Instagram account comicgodz) have snapped a few new shots of Tom Holland on the set of the 2019 film, sporting what’s apparently the fourth distinct spider suit that’s been spotted in relation to the movie. In this case, the darker-colored costume appears reminiscent of the one Peter Parker (or at least his body) wore during the celebrated Superior Spider-Man run in the comics, sporting a flashy black-and-red design. (No robot arms, though.) These shots were reportedly snagged in New York, but images from the film (including from Europe, where’s it been shooting previous) have also showed star Tom Holland in a mo-cap suit, the red-and-blues from Homecoming, and an all-black suit that’s slightly reminiscent of his out-of-continuity look from Spider-Man: Noir. Obviously, we don’t know anything about what’s actually going to happen in Far From Home, especially since Pete’s busy “not feeling so good” in the present-day MCU right now. 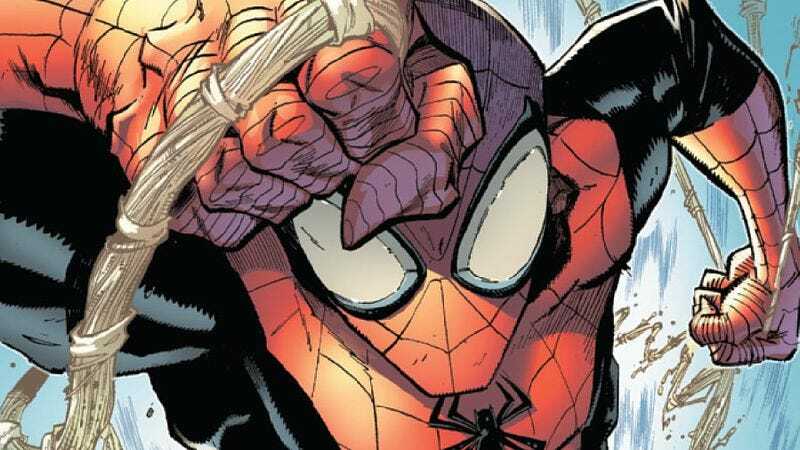 Still, it would be pretty insane if Sony tried to adapt the actual Superior Spider-Man plot—which saw Peter get mentally “killed” by Doctor Octopus, with his body taken over and used for semi-good by one of his oldest foes—into these movies; it seems much more likely that this is just a fashion choice, reflecting what might be a darker turn for Tom Holland’s take on the character in a post-snap, possibly post-Cap world.